If your website is primarily optimized to grow your list, you’re excluding those who are already loyal subscribers and customers. Someone discovers your content (usually a blog post) and sees that there’s a call-to-action (CTA) asking for their email address. If the CTA is interesting enough, they’ll opt-in. When new content is published, it’ll be emailed to existing subscribers. This allows the publisher to remain top-of-mind and nurture their audience. The issue lies with that third step, and I’ve already hinted at the problem above. Not only is it a bad user experience, but it’s also a missed opportunity. That customer, returning to read your latest blog post, could have seen an offer for a product they don’t (but should) have – but instead, they were incentivized to give their email address. There’s a lot to be said about using email to move people through these stages. After all, many companies are now storing purchase history and other data in their email marketing app, and sending segmented emails that promote one thing to non-customers and another to customers is becoming fairly commonplace. But websites are still the end-points of most emails. People are sent to a sales page, a new blog post, or back to the homepage via a logo in the header of the email or the email signature. So it’s critical to create an offer funnel that is exactly mirrored both in the emails you send and on the webpages visited. Map out what your offer funnel looks like. At a minimum, it’s going to have three stages: anonymous visitor, subscriber, and customer. After you’ve setup the foundations, you now need to sync data from your contacts database onto your website, and find a way to associate visitors with known contacts. To do this, you’re going to want to pass some identifying or segmentation information back to your website. How to do this differs for each email marketing product, but it’s typically done by appending the subscriber ID or email in the links you include in your emails. And when someone visits that article with the “id” query parameter, you’ll then phone home back to the email marketing app (via their API) to lookup whatever information you can about this visitor. A more anonymous way of doing this (that doesn’t require using an API) would be to pass segmentation information into the URL. You probably don’t want your website visitors to see things like “customer=true” in the URLs. Not only does it look bad, but if they share that page on social media… well, now everyone who clicks on their post is being treated like a customer. So you’ll want to strip out this identifying data from the URL and cookie it so that you preserve this segmentation information as they move around your website. Next, you’re going to want to change your calls-to-action based on the segmentation information you retrieved from the URL or your email marketing app’s API. If the visitor is anonymous, change these CTAs to have our opt-in form and the correct messaging and styling. If they’re a subscriber but not a customer, change the CTAs to have a link to a sales page. Rinse and repeat for every stage of your offer funnel. Now you’ll be able to change content, including calls-to-action, on your website based on data you have about the person visiting. It’s required a lot of coding and messing about with APIs, storing data in a browser session, and building a custom rules and personalization engine… but you’re all set! Fortunately, we’ve made it possible to achieve everything I covered above in less than five minutes. Configure it to match your site’s branding. 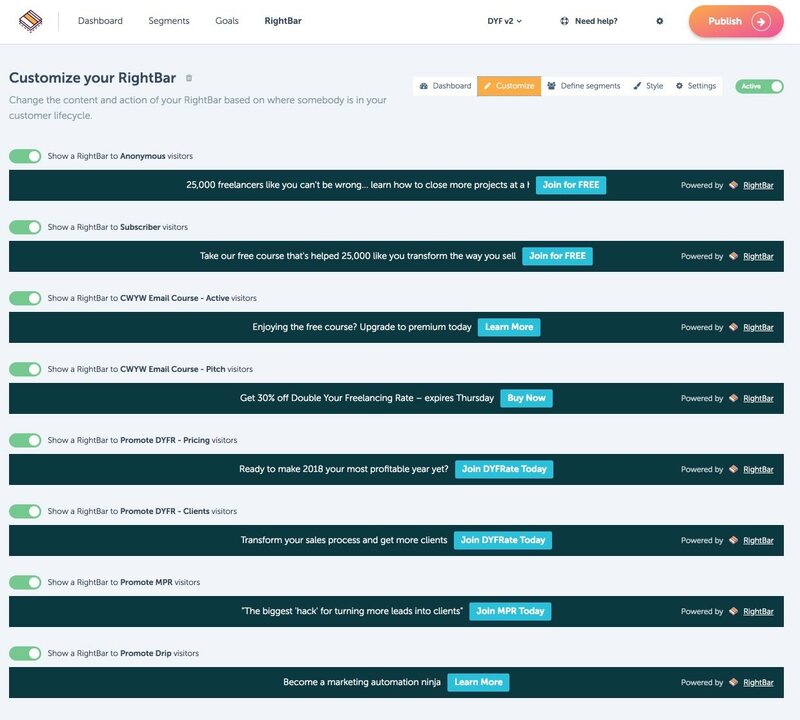 In minutes, you’ll have your website synchronizing in real-time with your subscriber and customer data, and can start displaying targeted offers that align with where somebody is in your sales funnel and what they should be doing next. 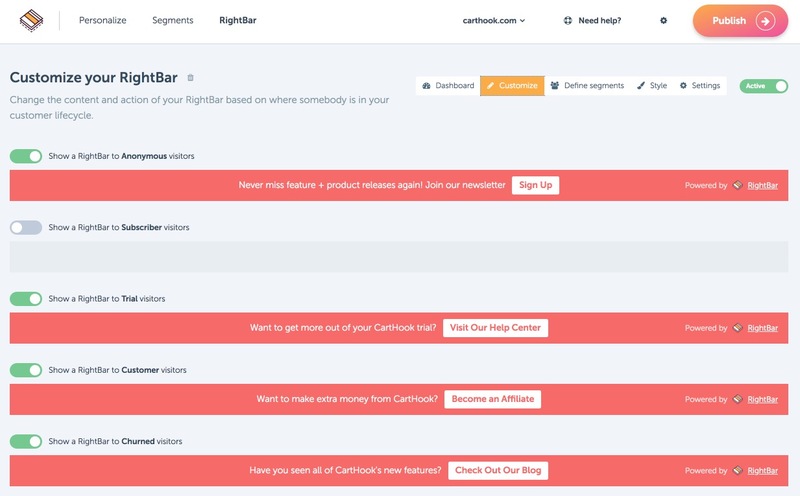 RightBar makes it easy to setup a simple CTA funnel anchored to the top of every page on your site, and then campaigns in RightMessage could be used to change virtually everything – headlines, images, testimonials, and more – based on offer funnel segmentation and other identifying or behavioral data. Remember: Your website’s job is to sell. For new people who are engaging with your brand and your content for the very first time, you want them not to be a “drive-by” – you want them on your list. And that’s what you’re doing now, and you’re probably doing that with things like welcome mats, exit popups, slide-in “toaster” widgets, and more. And neither should your website. So I’d encourage you to think through what your offer funnel should be (or use one of our templates) and start promoting the right offer, to the right person, at the right time.